1853: On the Monkeys of the Amazon. Speculates on the effect of rivers and other geographical barriers on the distribution of closely allied species. 1855: On the Law Which Has Regulated the Introduction of New Species. Wallace's thoughts on the laws governing the geographic distribution of closely allied species, including the Sarawak Law, and the implications of those laws for the transmutation of species. 1857: On the Natural History of the Aru Islands. First methodical biogeographic study. 1858: On the Tendency of Varieties to Depart Indefinitely From the Original Type. Paper on natural selection sent by Wallace to Darwin. 1859: On the Zoological Geography of the Malay Archipelago. Contains first description of the Wallace Line. 1863: Remarks on the Rev. S. Haughton's Paper on the Bee's Cell, And on the Origin of Species. Wallace's defence of the Origin on the topic of evolution of the hexagonal bee cell. 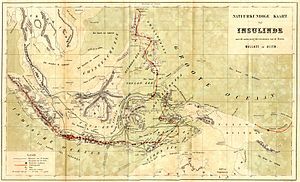 1863: On the Physical Geography of the Malay Archipelago. Paper on the geography and possible geographic history of Indonesia with concluding remarks on importance of biogeography and biodiversity that are frequently cited in modern conservation circles. 1864: On the phenomena of variation and geographical distribution as illustrated by the Papilionidae of the Malayan region. Monograph on Indonesian butterfly family with discussion of different kinds of variability including individual variation, polymorphic forms, geographical races, variation influenced by local conditions, and closely allied species. 1889: Forty-five years of Registration Statistics, proving Vaccination to be both useless and dangerous. 1891: English and American Flowers. Contains speculation on how glaciation may have affected distribution of mountain flora in North America and Eurasia. ^ Wallace, Alfred Russel. The dawn of a great discovery "My relations with Darwin in reference to the theory of natural selection"1903. Black and White 25 (17 January): 78. ^ 著書一覧はCharles H. Smith,"Bibliography of the Writings of Alfred Russel Wallace". The Alfred Russel Wallace Page hosted by Western Kentucky University. ^ Shermer, Michael(2002). In Darwin's Shadow pp. 15–17. Shermer, Michael（マイケル・シャーマー) (2002). In Darwin's Shadow: The Life and Science of Alfred Russel Wallace. Oxford University Press. ISBN 0-19-514830-4.